Top of the morning to ya! How is everyone today? Today I bring to you a spot for one of the finest whiskey's around, Jameson. The approach they took was quite similar to something Johnnie Walker did a little while back. The one thing that made the Johnnie Walker spot great was that it took a historic approach to the ad. They used storytelling as a way to entice and draw your attention. It was extremely well done, as this one is as well, though it's not as good. 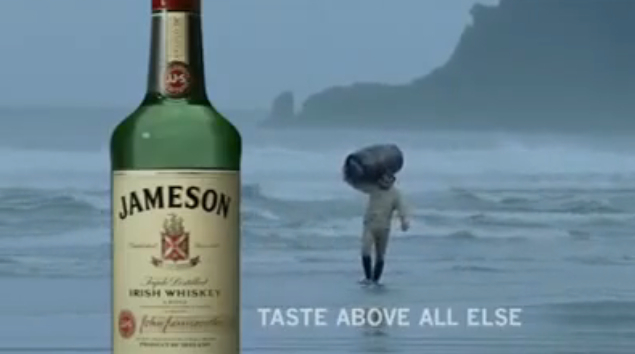 Here you have Mr. Jameson jumping into the ocean, after seeing a crate of his beloved whiskey fall in. Seriously though, who wouldn't jump in? ...and if haven't seen the Johnnie Walker commercial, check that out here too!